Insha leads Vera’s work on bail reform, pretrial justice, and jail reduction in New York. She has led research on the use of bail in New York City criminal court arraignments, jail trends across New York State, and regularly presents to advocates, judges, defense attorneys, and prosecutors on bail reform, pretrial justice, and reducing jail incarceration. 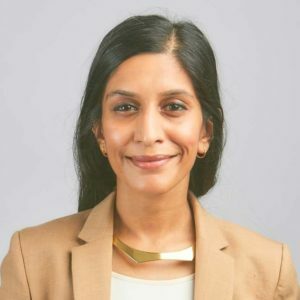 From 2016-2017, Insha served as staff to the Independent Commission on New York City Criminal Justice & Incarceration Reform, a blue ribbon commission chaired by former Chief Justice Jonathan Lippman of the Court of Appeals to study Rikers Island and criminal justice reform in New York City. She has been quoted as an expert on bail reform in The Nation, City and State, New York Times, NPR, and PBS’s MetroFocus, among other outlets. She serves as a board member of the New York Civil Liberties Union and the Brooklyn Community Bail Fund. Prior to joining Vera, Insha was a public defender at The Bronx Defenders for five years. Insha also worked at the Center for Alternative Sentencing and Employment Services, a Vera spin-off that provides alternatives to incarceration for youth and people with mental illness, and, prior to law school, at Vera’s Center on Immigration and Justice. She holds a JD from the City University of New York School of Law and a BA in Africana Studies from Vassar College. From "Bail Stories," co-produced by the Mayor's Office of Criminal Justice and the Vera Institute of Justice.